H.K. Bush, is a professor of English at St. Louis University, a former Fulbright Senior Scholar in Freiburg, Germany, and a Senior Fellow at Waseda Institute in Tokyo. Prof. Bush is most noted for his work as a scholar of Mark Twain, Abraham Lincoln, and Harriet Beecher Stowe. His most recent book, Continuing Bonds: Parental Grief and Nineteenth-Century American Authorship (University of Iowa Press, 2015), is a cultural history of the deaths of children in the nineteenth century in America, and specifically how grief influenced the written works of major American authors. Previously, Lincoln in His Own Time, appeared in October of 2011 from the University of Iowa Press; and before that, Prof. Bush authored a highly acclaimed cultural biography, Mark Twain and the Spiritual Crisis of His Age (2007), and American Declarations (1999). In addition, he writes regularly in popular venues such as Books & Culture, Christian Century, The Cresset, and the St. Louis Post-Dispatch, among others, and is also founder and contributing editor for the Heithaus Haven on-line blog community. 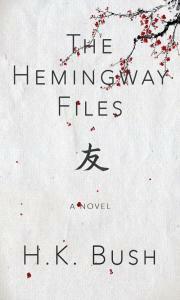 The Hemingway Files is his first novel.